Good afternoon, and welcome to JT Hughes Honda in Shrewsbury. 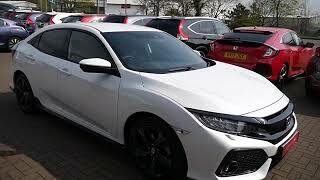 Today I'm going to show you around our Honda Civic Sport that we currently have as a demonstrator. Now, this is the Sport spec, finished off in the Pearl White paint and is the automatic version, which is the 1.5. On the Sport, you do get your rear parking sensors as standard, as well as your twin exhaust. Rear parking camera, located just above the registration plate. Not surprisingly, the Civic has got quite a large boot space. The Sport also comes with rear privacy glass, 17-inch black alloy wheels, cloth interior throughout, front and rear electric windows. And being one of our demonstrators, a five-year service plan is included in the price of the car. Towards the front, it comes with LED daytime running lights, front fog lights, headlight washers. And up in the centre of the windscreen, you've got your Honda Sensing unit, which is there for your driving aids and your safety features. Being one of our demonstrators, it is available with a low rate finance option. Come to the front. It comes with a multi-functioning steering wheel, with built-in intelligent cruise control, automatic wipers and auto headlights. Bluetooth facilities, Android Auto and Apple CarPlay also included. Climate control, the automatic gearbox with electronic handbrake.